Trying to study from home? It's not easy. This week's episode of the Studyclix Podcast is packed with advice on how manage studying outside the pressures of a school environment. There are many occasions when students find themselves having to study at home. Weekends, Easter holidays, mid-term breaks, summer holidays, etc. Whatever struggles you may be having with motivating yourself to study at home, Eimear and Nessa talk about it all in this week's episode of The Studyclix Podcast. 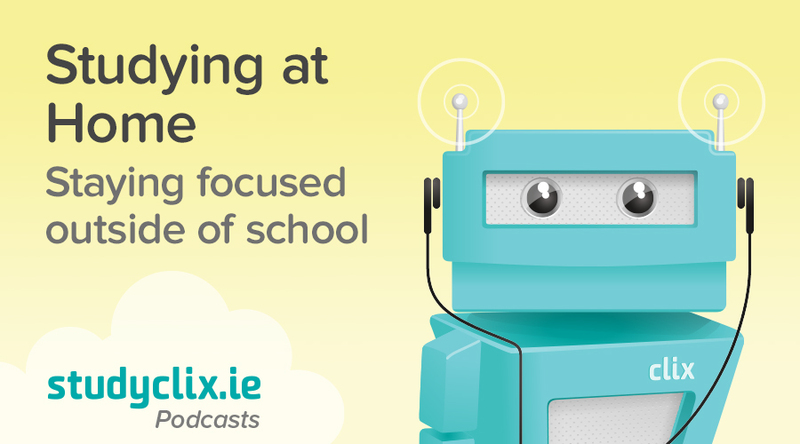 Don't forget to subscribe to the Studyclix podcast for new Leaving Cert advice content every week and if you enjoy the podcast be sure to leave us a nice review on iTunes. If there's any topics you'd like us to discuss on the podcast, please let us know! You can follow Studyclix on Facebook, Twitter, Instagram or Snapchat (study_clix) and share your ideas with us there.